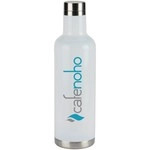 Balboa Column Custom Water Bottle - 30 oz. Shatter Resistant Custom Water Bottle - 30 oz. Poly-Fresh Promotional Sports Bottle - 25 oz. This promotional sports bottle is a great giveaway to any outdoors or sports person.